The Trakehner is a European warmblood horse of East Prussian origin, the foundation for which was laid at the main stud farm established in Trakehnen, East Prussia in 1732. The breed's name is derived from this world-famous farm, and the bloodlines can be traced back to this source. At the beginning, the horse was a stocky, strong native animal which needed size and refinement. The really important and decisive development of the breed, therefore, occurred in the early 1800's when top quality English Thoroughbred and Arabian blood began to be introduced in small quantities. The goal of the breeding programs then became directed toward breeding a better endurance horse which would prove himself not only highly efficient as a riding horse during wartimes, but also as a working horse on East Prussian farms during times of peace. The object, ultimately, was to add the size, nerve, spirit and endurance of the Thoroughbred to the bulk, stability and nobility of the native breed. Further refinement in the breed came with the addition of Arabian blood. The Trakehner of today is a large horse, standing generally between 16 and 17 hands. 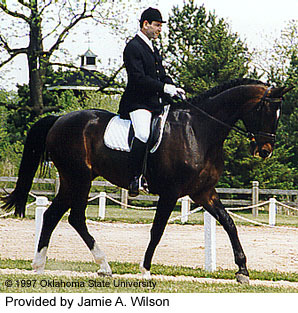 The breed is characterized by great substance and bone, yet displays surprising refinement, perhaps more so than any other European warmblood breed. It is a superb performance horse with natural elegance and balance. 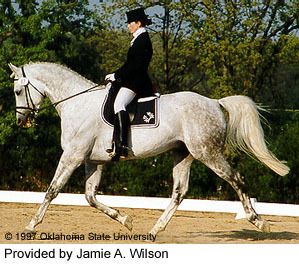 It excels in dressage because of its elegant way of moving - the light, springy, "floating trot," and soft, balanced canter, made possible by a deep sloping shoulder and a correct, moderately long back and pasterns. With its characteristic, powerful hindquarters and strong joints and muscles, the breed also produces outstanding jumpers. 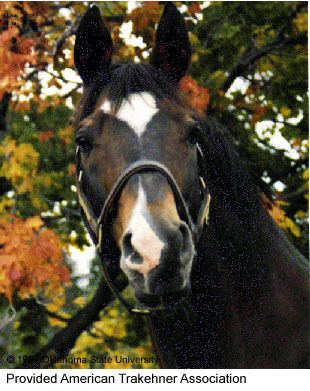 However, perhaps the most outstanding attribute of the Trakehner is its temperament. It is keen, alert and intelligent, yet very stable and accepting and anxious to please. All over the world today Trakehner horses continue to excel in most disciplines of equine competition, although since World War II, when they were driven from their East Prussian homeland, the primary breeding area has been West Germany. The breed was first introduced into North America in significant numbers only in the late 1950s, being imported first into Canada and then later into the United States. American Trakehner Association, 1514 West Church Street, Newark, Ohio 43055. Phone: (740) 344-1111.